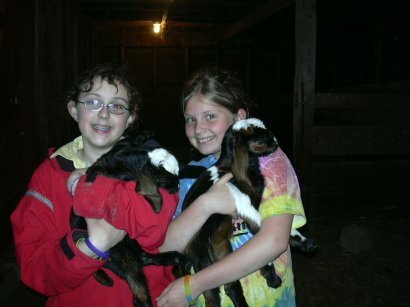 My sister, who loves visits to the farm, insisted on getting a photo with a couple of the week-old baby goats (kids). Here ya go sis – and thanks for all the help with the party! Pearl successfully gave birth today. Last year we just found her two newborns dead. This year she had two kids and is fairly fierce in guarding them. They one that looks like her is a male, named Henry and the brown one that looks like her father, Harriet. 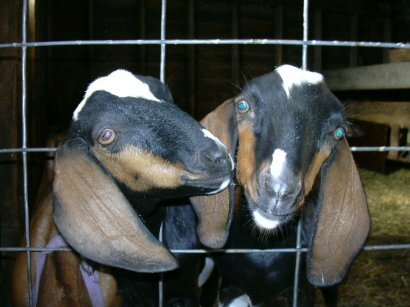 After we found them in the pasture, we moved them to a pen to get acquainted and not lose each other. The children went into look at the kids in the pen and she started pawing the ground, then lowered her head and the children decided it was time to leave. 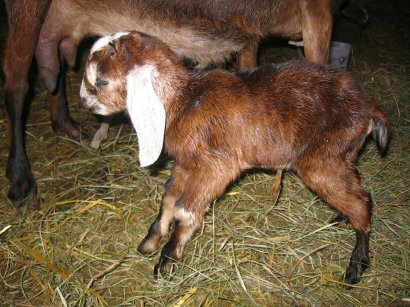 Fern delivered her first kid! Fern is a very undersized doe and we weren’t sure how she’d do with her first delivery. Because she was so small, we waited two years to breed her. But she delivered her first kid with no problems and we can now introduce you to Hazel. Martin had naming rights to this kid, based on the fact he was the only child home when the baby was discovered – Martin picked Hazel as the name, so Hazel it is. Today we got word from the lab via the vet that Nellie tested negative for rabies. So we no longer have the prospect of that treatment over our heads. 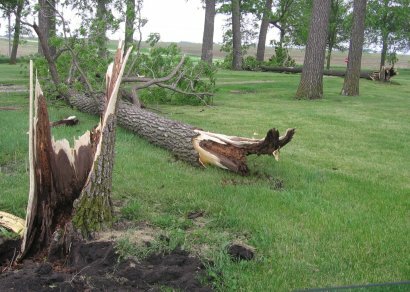 We had a juxtaposition of events that causes us to rethink how we do some things around the farm. Before Christmas, Nellie,Â our two-year old Nubian became thin and we had her stool tested for parasites and found she was indeed in need of treatment, so we did that and she was getting her weight back on. In this picture from just before Christmas she is furthest to the left. The vet gave us some wormer and she seemed to be on the upswing, and put weight back on. 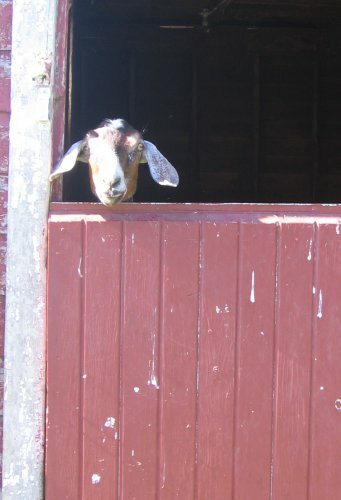 Last Wednesday when I was in the barn, I heard a goat bawling like one had their head stuck – I looked and everyone looked fine, but it was Nellie bawling. 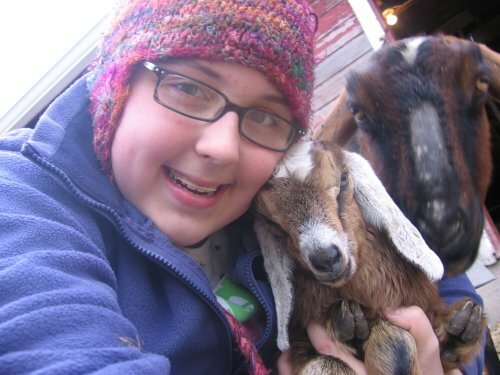 I thought she may be missing the goat we recently removed from the herd. An hour and a half later Emma went to do chores and Nellie was down. We called the vet and he was out in an hour and her body temp was 3-4 degrees below normal, he administered the usual antidotes, and asked if we had a heated building to keep her in. 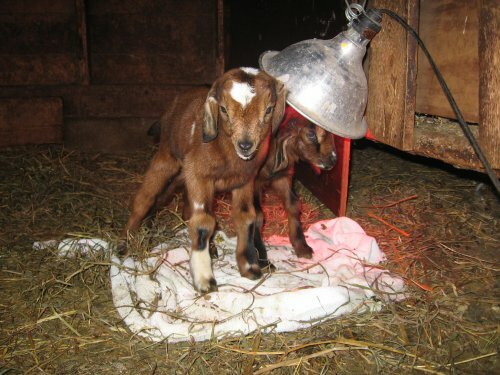 We tried bringing in some heat lamps, but it was not going to keep her warm enough, so she went to the vets. To make a long story short, while we were attending the PFI conference, we were getting updates on Nellie, none of them good. The vet thought she ended up with some neurological damage, and cautioned us that there was a remote chance she could be suffering from rabies. By Saturday morning it was clear she was not going to come out of it and she was put down. All this was against the backdrop of a 3 hour session I attended by holistic veterinarian Will Winter who opened our eyes to many things we have been somewhat (opposite of proactive) about. 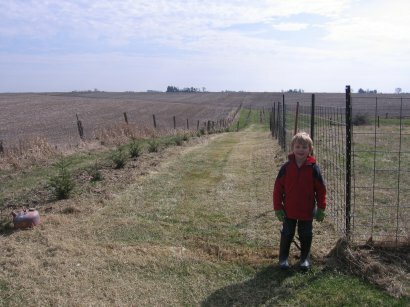 He made a very string case linking pasture health, mineral content of soil, and pasture brix level to herd health, particularly parasite control. 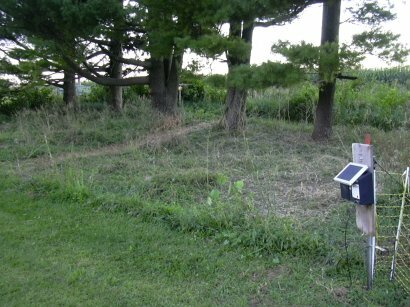 We just started using the pasture and creating separate paddocks within the last couple of years and have done some overseeding to increase plant diversity and medicinal herbs, but we have not yet performed a soil sample to see what kinds of mineral deficiencies we may have in our soil, and therefore in our pasture plants, therefore in our animals, and ultimately in us. 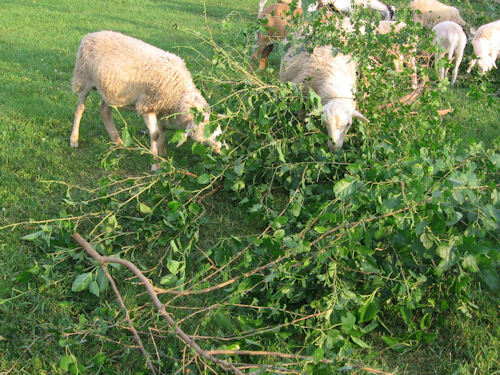 So this spring brings a renewed emphasis on pasture improvement. But back to the unpleasantries. 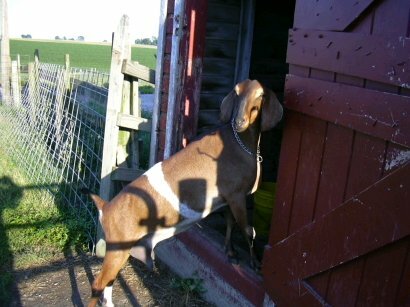 So this morning, IÂ arrived at the vet clinic at 8:00 to deliver the goat head to the Iowa State Vet School for rabies testing. I must admit it was unsettling to pick up a sealed foam cooler that contains the head of your goat to get a test that could lead to a series of… oh well, let’s just stop there and wait for the results. 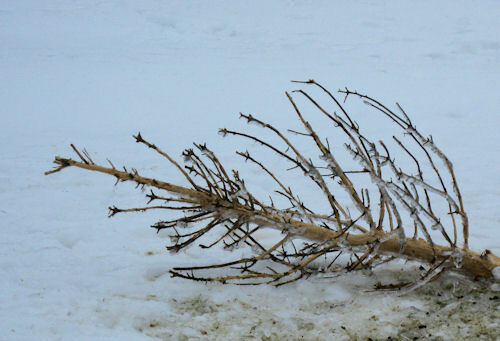 After serving as a Christmas three,Â it finds one more use before being the first piece thrown on next year’s burn pile. 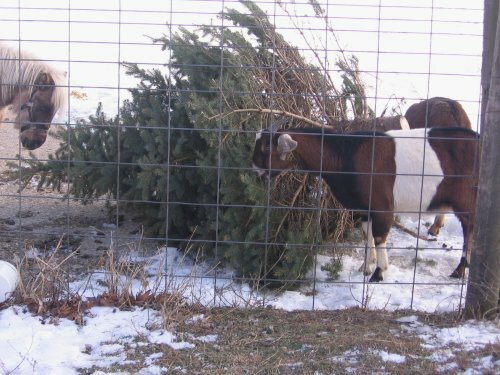 Although spruce is not the tastiest of all forages, nonetheless in deep winter the goats appreciate some fresh browse. They are nibbling at the newest branches with the most tender needles. Milo is having some troubles. This morning he looked dead, with a faint heartbeat. We brought him in the house and for the first time, tubed an animal. That involved taking a tube and shoving it down the kid’s mouth about 10-12 inches down into the stomach and them injecting milk from a syringe into the stomach, via the tube. It’s one of those things that is a bit unnerving the first time you do it – put it accidently into the lungs and you drown the goat. 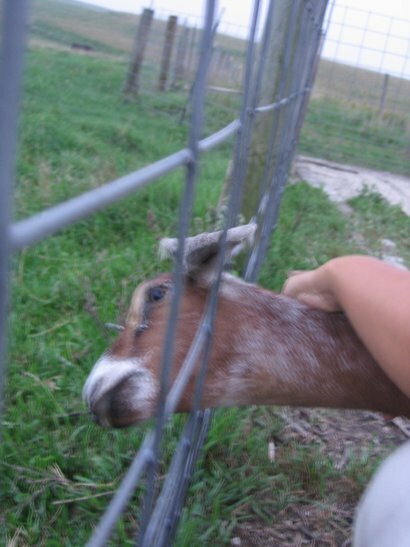 But this goat was virtually totally unresponsive and we had nothing to lose by trying. So Linda gave it a try. Milo laid motionless for about two hours after that on a heating pad in the house. Then he blurted out once and I was able to get him to drink some more out of a bottle. He then actually got up. Then he slept for a few more hours and ate again and seemed miraculously vibrant. I thought since he was walking around, he should go back to momma, so brought him back in the barn – but within a few hours later, he was cold and sleepy again, so he came back into the house and was used as a “lap goat” on the couch and spent the night in the house. We’ve been anxiously awaiting Nellie’s first birthing experience as first timers can have problems until they figure it out. Paullina gave birth 2 1/2 weeks ago. Here are Milo and Fern – a girl and boy. They are very small but seem like they might be ok. Nellie has an “oh shi#*” look in her eyes, but seems to be licking the kids and murmering to them in the proper goat way. 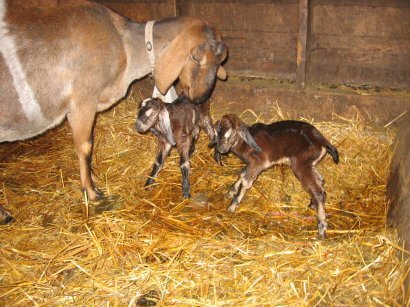 Here they are a few hours after birth, Fern on the left, Milo on the right. Compared to their barn mate Solo (being held by Emma) they are shrimps. Solo was born 17 days ago and was not a multiple birth and so he looks like a giant. 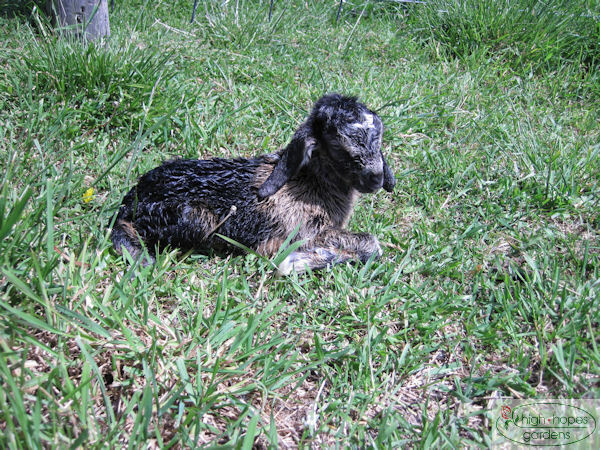 The kids have officially named the baby goat. The first name that hung around for a few hours was Henry, but eventually it turned to Solo. Â It reminds me of the story of a confused student assigned to write an autobiography in a high school English class. Â Through a google search of “Tito” the student wrote the fascinating and far-ranging story about “Marshall Tito Puente” and his amazing life as Yugoslavian dictator and latin bandmaster. 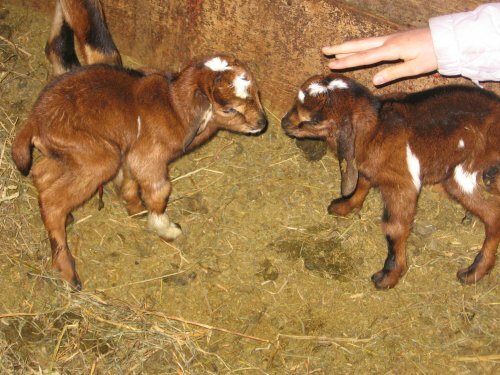 March 29, 2008 – Baby Goat! 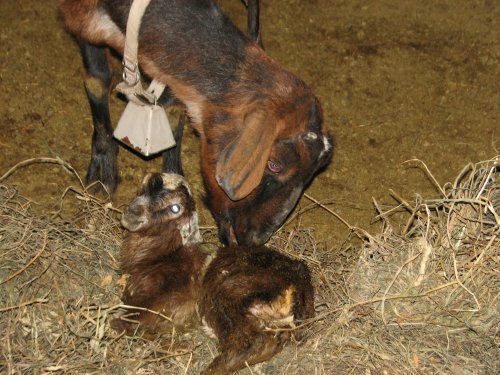 Sometime between 8 and 10 this morning Paullina gave birth to her baby boy! She’s a good worry-free mother who always does well with her kids. This is the first year she’s only had one, but this guy looks big and vigorous. If it makes any difference, we were hoping tha Paullina would give birth before Nellie, who is pregnant for the first time. We hope she picks up some pointers from Paullina as she is close to her first birthing experience. It’s the week after a long vacation. Nelllie and Paullina went to Morning Sun farm a few miles away to stay with their friends Ringo and Bingo while we were away. We went and retrieved them this morning and started back into real life again – school, work, and laundry. Yesterday “Don Juan” the very young nubian buck came to stay a spell at high hopes. He and the two does introduced each other properly by promptly sniffing each other’s behinds. 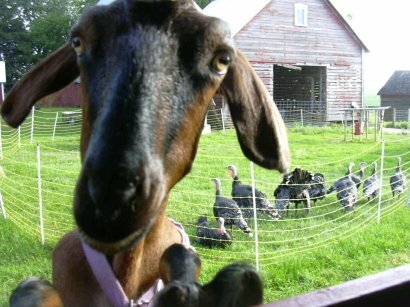 So, many happy sniffings to all the goats out there needing to get lucky this fall! Sometime last night, Paullina gave birth to two kids. The boy has the waddles, like his daddy, Sugar. 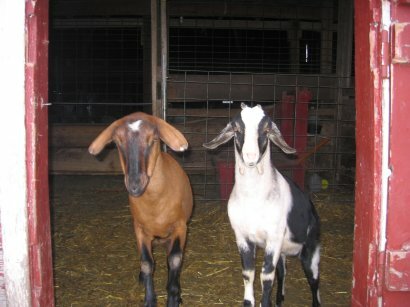 These kids are a Nubian/Alpine mix. Here’s Emma holding the boy with under the watchful eye of Paullina. Sadly, we lost the girl kid. 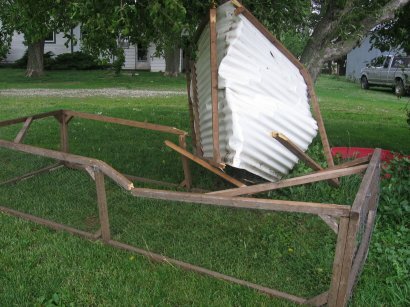 We have some pens made up of cattle panels in the barn and one of the panels wasn’t entirely secured and some time during the day it fell down and the kid happened to be underneath it when it fell and it died. It’s one of those things that just wrenches your gut to see that dead nearly newborn kid. Then you go through all the what-ifs? 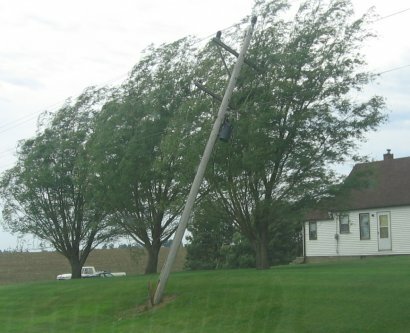 What if the panel hadn’t fell? What if the kid hadn’t been underneath it, what if it happened on one of the 5 days a week someone was home all day instead of one of the 2 days everyone is gone? And so it goes. Not a happy on the farm day. In the evening, as neither of us has not yet seen an opera and a touring company was presenting the Marriage of Figaro at Stephens Auditorium in Ames,Â we were able to go both see our first opera. We both enjoyed it – like most things it was much better live than recorded. This week’s Photo Friday Contest theme is “Fresh.” Here’s a shot from the high hopes archives of milk about as fresh as you can get it! This is one of our milk goats, Paulina. We all know there’s more than one meaning to “fresh” so keeping that in mind, and in keeping with the goat theme, here’s another photo. Back up to about 6 months before the milking picture for Mr. Billy getting “fresh” with his lady! 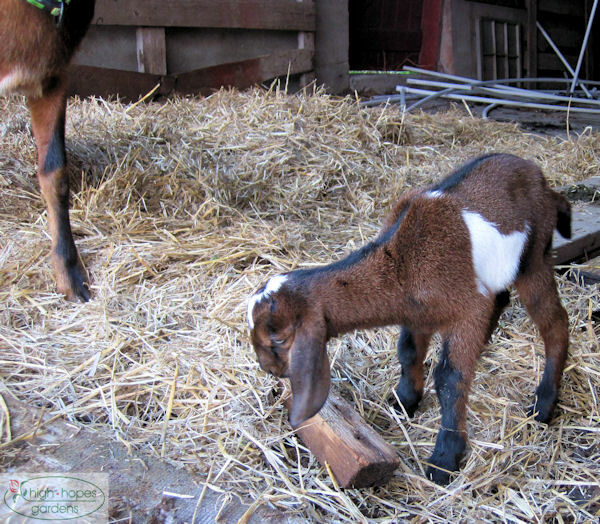 Yesterday the good people at Morning Sun Farm brought a young Alpine goat buck when they came over to make soap. His name was alternately “Whiteface” or “Sugar” and we decided to call him Sugar, pronounced “Shoog-uh” as his job is to impregnate Paullina and Blaze. 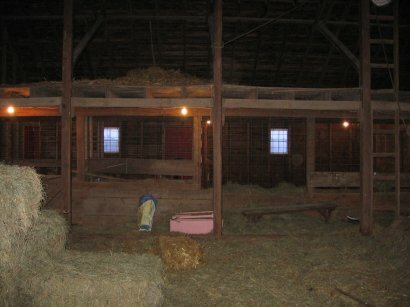 The two young boys went to the sale barn on Saturday, and the two young girls went to Two Friends Farm for a while. Here’s Shoog-uh with one of his harem. 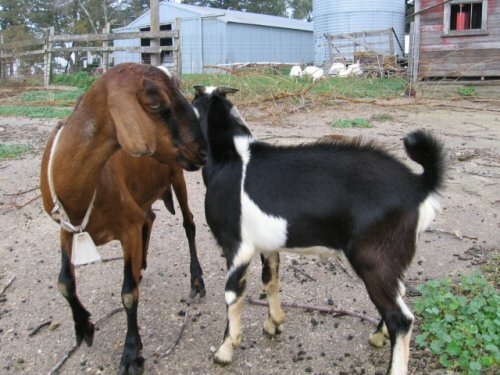 This evening the goats were bleating like they do when one gets separated or they need help. It’s a different kind of sound than the “feed me” or “milk me” sounds. Nellie caught her head in the fence. 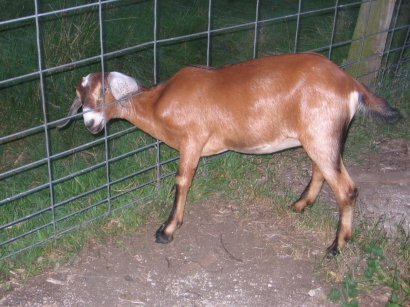 Finally, it’s time for the fence bending blocks and levers to try to bend the wire just enough to release the goat. If this doesn’t work, the ultimate solution is the sawz-all! Last night it started raining (about 2.25 inches worth of driving rain) about 3:30 am and strong east wind and unseasonably cold August temperatures in the mid-50’s. I started to worry about the chickens outside, but tossed fitfully until first hint of light, hoping not to see a pile of dead birds. Just one died – a turkey – but I jerry-rigged additional shelter with tarps to get them through the rest of the day. Goat milking season is in full swing. It’s good for drinking, making yogurt, and a bunch is finding its way into the freezer for goat’s milk soap. 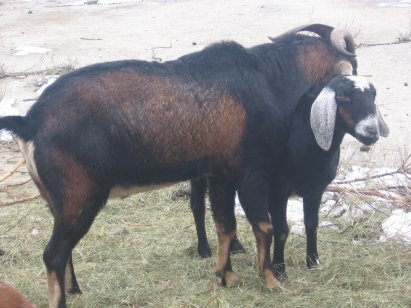 Here’s the front end of the goat during milking. 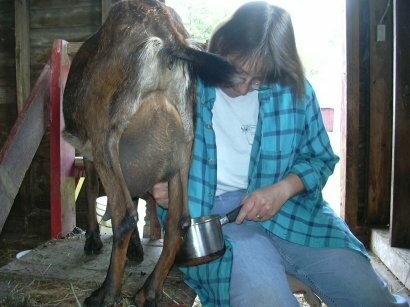 Here’s the milking end of the goat. 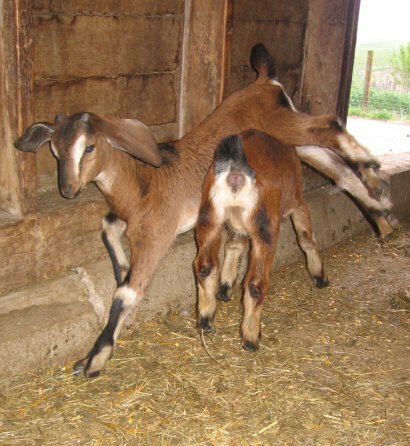 Quite literally, here’s the kids at play during the milking. I’ve got a little bit of feeling in my hands tonight of the long-time Minnesota tradition of fishing opener. It’s been cold and windy and drizzly/rainy for many days now, but this evening we went out just before dark to pull weeds from the perennial flower garden. Now my hands have that deep stiffness from the wind, wetness, and cold, much like repeatedly dipping your hand in the minnow bucket on a windswept lake in the middle of May. This morning Martin was the perfect gentleman. As soon as Mom got up, he brought her the Sunday paper in bed. Then he brought up a cup of coffee. Then a bowl of strawberries with a dollop of whipped cream. Then some sliced pears, egg scramble, and toast, finally a piece of organic dark chocolate and bussed the dishes downstairs! This afternoon he took Mom to see a stage version of Winnie-the-Pooh. He ended the day, helping in the garden. 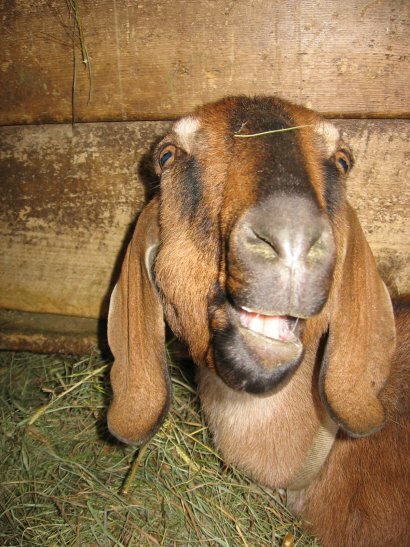 I’m not sure what this goat is trying to say, but she looks like she’s got a bit of a swagger to her. 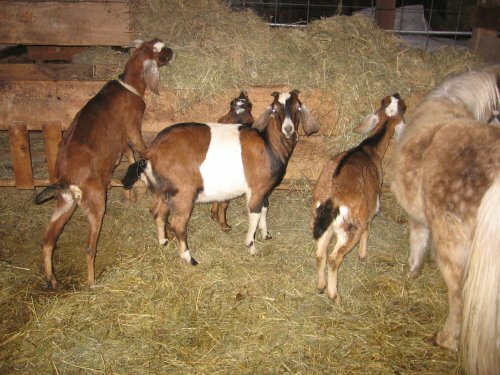 Even more goats came over to be bred by Billy. Billy and Ringo have been very cozy lately – Ringo wagging her tail furiously and sticking around Billy. The goats do not like to go out on the snow – there are very few tracks out in the snow. Today we went to fetch Billy. He and Blaze “hit it off” right away. Blaze’s tail was wiggling and happy to see Billy. We’ll have Billy for about a month before he moves on. Hopefully Paullina’s time will come as well. 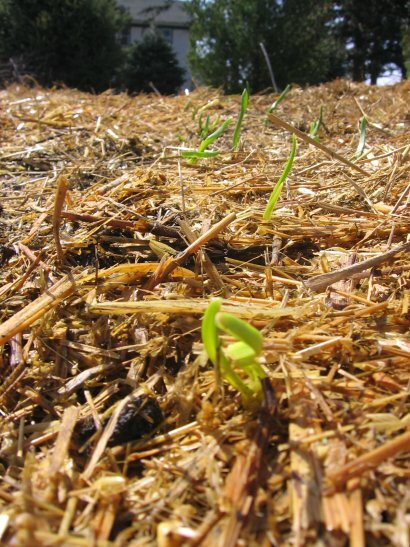 We can sure tell there is a Billy here – it really stinks in the barn now. Today Maizie entered the stinking dog sisterhood by finding and rolling in something disgusting. The girls gave her a couple of baths to try to remove the smell. It was probably a good thing after coming home from the shelter – she is reported to be much more fluffy now. Today we entered into a somewhat mysterious partnership with a neighbor we don’t really know in purchasing a Nubian buck from another neighbor who is moving, cleverly named “Billy.” We need buck service for our two ladies, and the other neighbor is willing to keep the buck at her place as she had many more does to service. Anybody who has been around goats, knows this is a good deal and the Billy goats are quite pungent. We hope it works out. Linda had her semi-annual clean the chicken coop day. It’s part of our agreement- she does manure hauling, I deal with dead (animal) bodies. Today was another market day in Grinnell. It was “Happy Days” in Grinnell, so the market location was replaced with a car show. There were many more people in town, but about the same number of market farmers. We had ramped up, expecting to sell more than usual, but it was an ordinary day. The lambskins are popular – we’re down to one left. 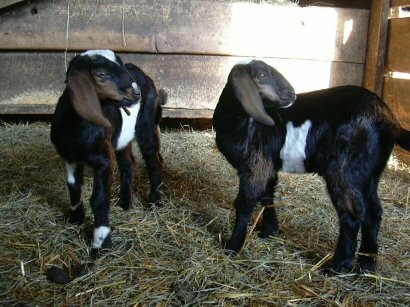 The baby goats are growing up. Here’s a portrait of Thing 1. 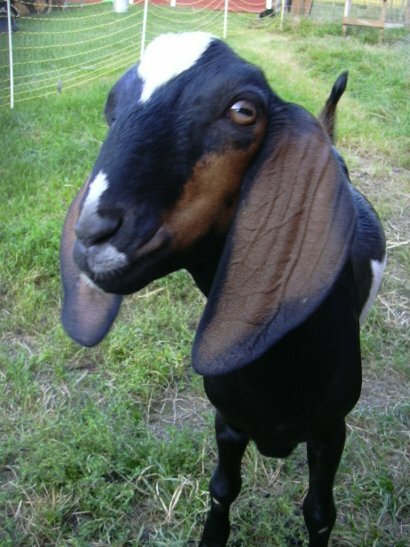 Are goats part of the solution to the rising oil prices? 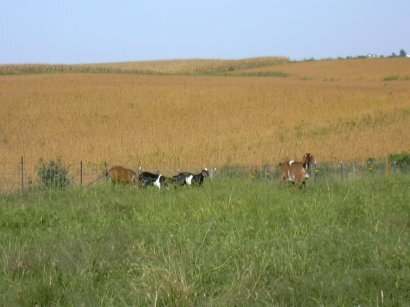 I promised ya’all before and after pictures of an area pre- and post-goat. Due to a technical malfunction (I erased the “before” pictures – you’ve all got to remember I’m still operating with a Dell and Nikon camera, not the Televac 62000). 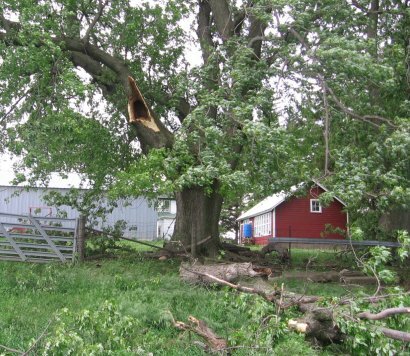 There is an area under some big trees that is prone to overgrowth by mulberry and other brush. 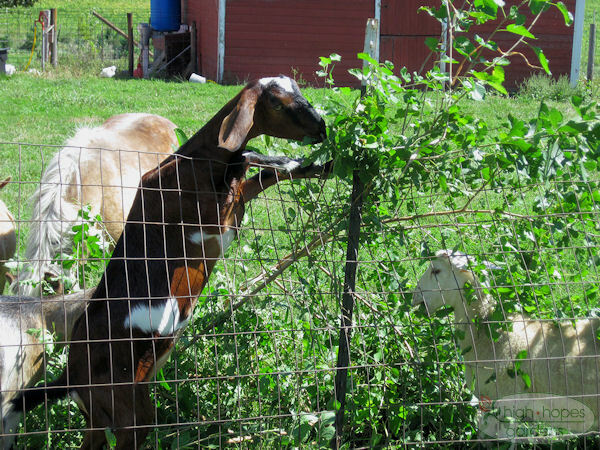 It has been a pain to keep it clean via mowing or cutting with pruners or a heavy-duty weed whip with metal blades, so I turned the goats loose surrounded by our electric netting fence powered with a solar fence charger. It worked great as you can see by the following picture. 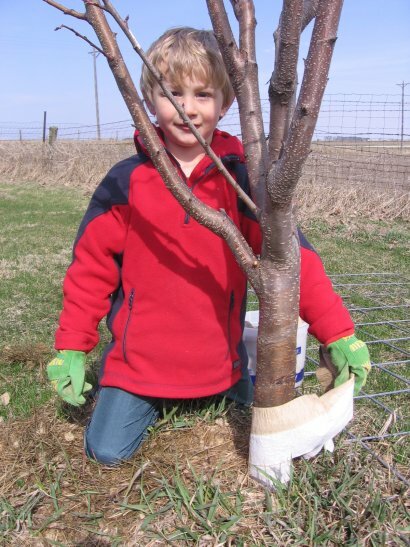 You’ll have to imagine a brushy area under the trees, with lots of 3-6 foot mulberry shrubs. 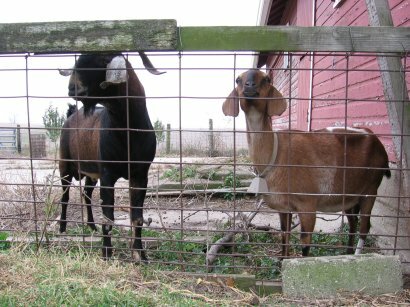 August 18, 2005 – Got Goat? Pictures don’t get more goaty than this! 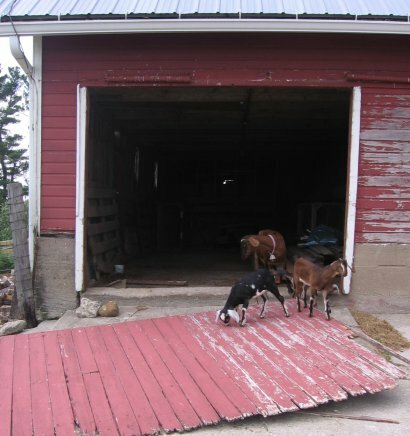 Here’s Paullina standing up against the lower half of the barn door. Number One and Number Two are growing up nicely. They suffered the fate many of us face of being born male. I promised more milking pictures. Here they are. 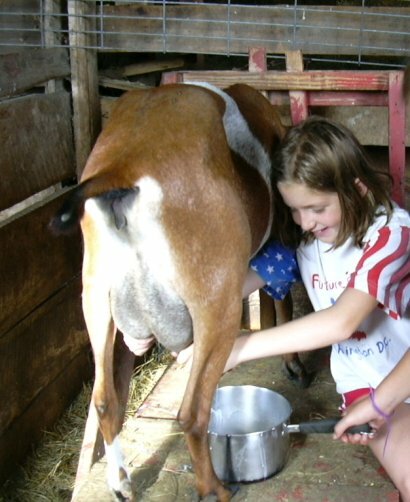 Hand milking is a long lost art. 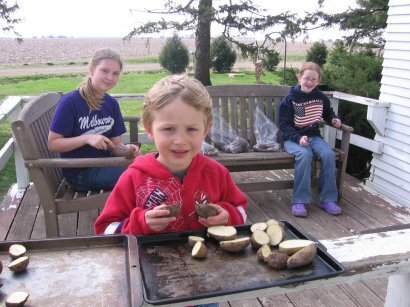 Here another human gets passed down this basic farmsteading skill. 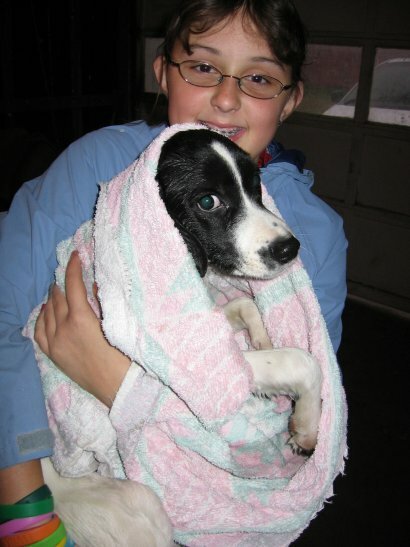 August 15, 2005 – Welcome Blaze! 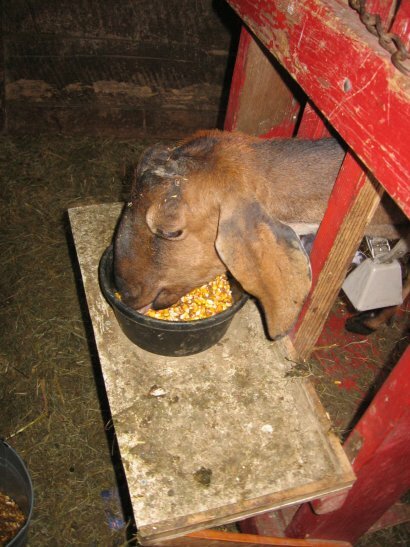 I know, Blaze sounds more like a horse than a dairy goat, but a dairy goat she is. She was a ribbon winner at the Story County Fair and some neighbors bought her a few weeks ago before they knew they were moving. Getting the goat home was like a scene one may have seen in a joint episode of “Sanford and Son “and the Beverly Hillbillies. The truck was crammed full of garbage for a dump trip the next day, so we brought the “new” utility open-top trailer and Linda and the goat rode in the back. Here’s a head shot. She’s a great milker. We let Paullina rest starting last week, so it’s nice to get some more milk. Today was the day for goat pedicures at High Hopes. Nothing but luxury here! 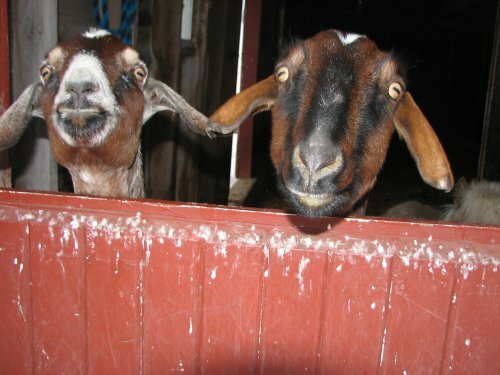 We are rookies at the goat hoof trimming experience, but here’s how it goes. Paullina is led into the barn to the goat stanchion for trimming. 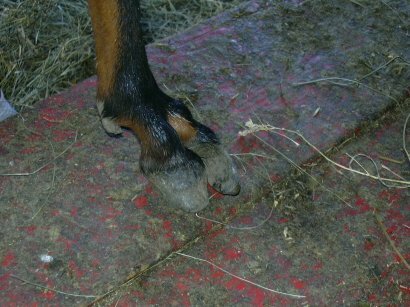 Here’s a before picture of a very overgrown goat hoof. 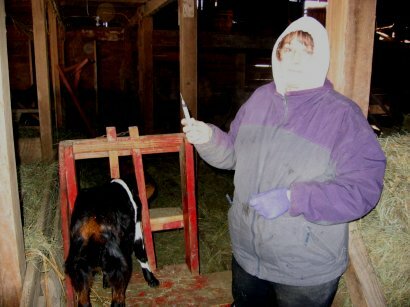 Linda hard at work trimming the hoof. It doesn’t hurt the goat, but the material is very hard and needs special goat shears. 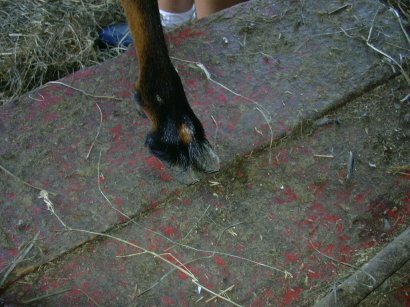 Here’s a newly trimmed hoof. A picture of all 4 hooves neatly trimmed! 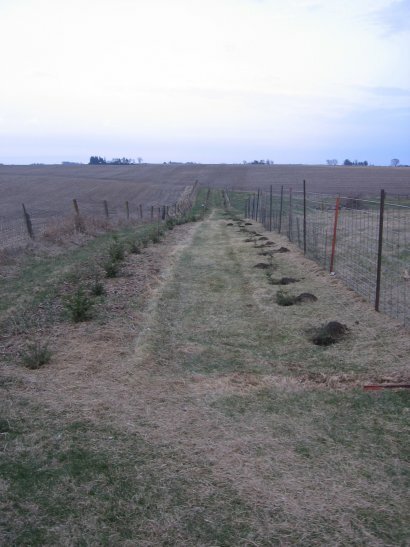 Besides this, we also got the chicken house shoveled out and lots of mowing and trimming around this year’s tree planting. 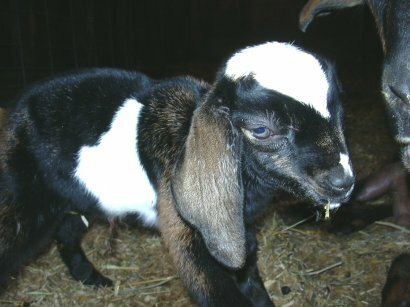 We have recently started miling Paullina, our Nubian goat. We have a nice milking stanchion courtesy of some neighbors. 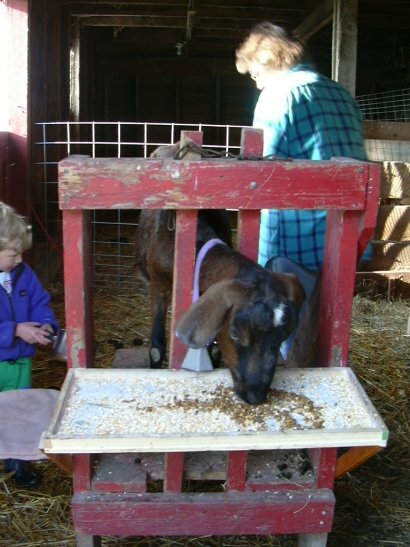 All we had to do to use it was to add a feeding tray so Paullina could eat while she was being milked. The milking begins traditionally enough, with Linda pulling one squirt at a time. Soon however, this must become tiresome for Paullina, so she begins to lean on Linda, gently at first and as she continues, leaning more and more. This reminds me of a band playing in Austin, TX at the end of the month (I was checking out the music listings for when we visit at the end of the month). I’m guessing there is not a steel guitar or mandolin in “Super Heavy Goat A#$” (last two letters of band not faithfully rendered). I think Paullina may be leaning because whe is a) ready to be done b) wants to have the other side milked, or c) want to see her kids which have been separated from her all night. 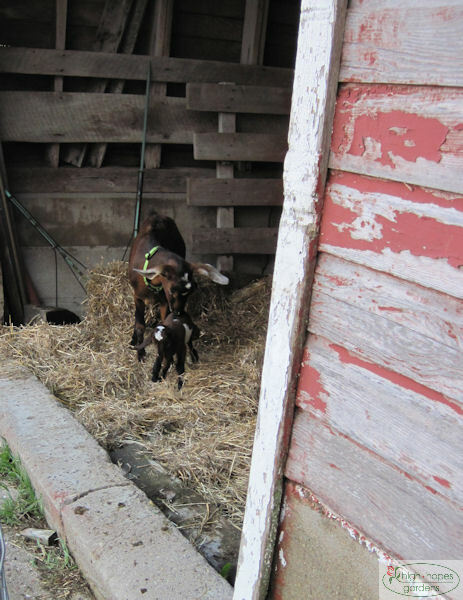 Here’s today’s rainy day shot from in the barn of the the two goats and a couple of kids. 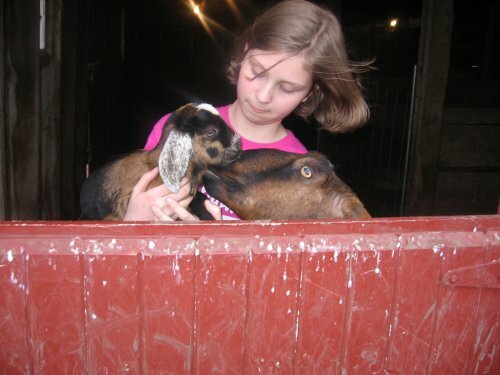 The girls learned about the not-so-cute part of goat husbandry today. 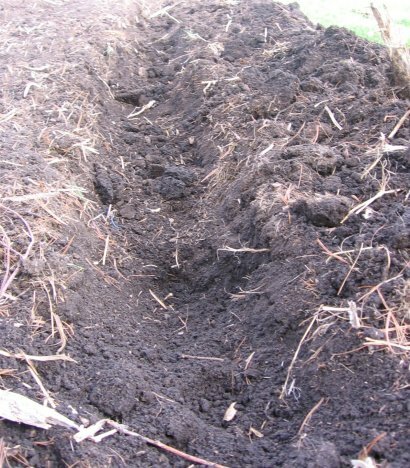 As every parent knows, newborns have a predictable, if not variable excrement pattern. The first “discharges” are tarry and black, and once they start nursing, the semi-solid yellow follows. 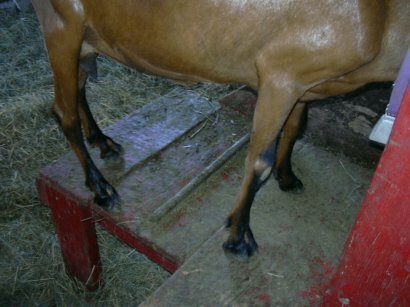 Well, shall we say the goats don’t have good “clearance” and much of the yellow stuff ends up stuck on the little guys. But other than that, they’ve been faithfully monitoring to make sure they are getting enough milk and getting the hang of nursing. This morning there was a break in the rain, so “Spiderman” (a.k.a. Martin) and “Green Man” (a.k.a. Dad) went to work. We planted 11 more potted chestnuts and seeded and covered the mudhole with marsh seeds. Today’s rain has been just perfect (so far) that it hasn’t washed away the seeds. Spiderman was very good at fetching trees, putting empty buckets back on the wagon, and putting the empty containers back as well. Spiderman and Green Man actually worked faster than Green Man could have worked himself. Martin is fascinated with Spiderman, – I’m not sure where he came into contact with Spiderman, but according to Martin, he is half good and half bad. His Mom was a spider and his Dad was a Dad. 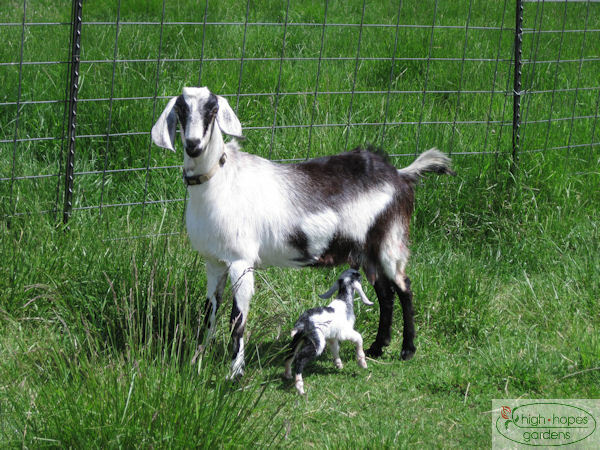 The mama goat finally decided to let loose her kids today, 5 days past her due date. When we got back from church, they must have been only a few minutes old, a half hour at most. They are both boys (last year she had triplet girls). I’m not sure what we’ll do not going out to the barn in the middle of the night. One of the girls usually checked around midnight and Linda around 3 am or so. 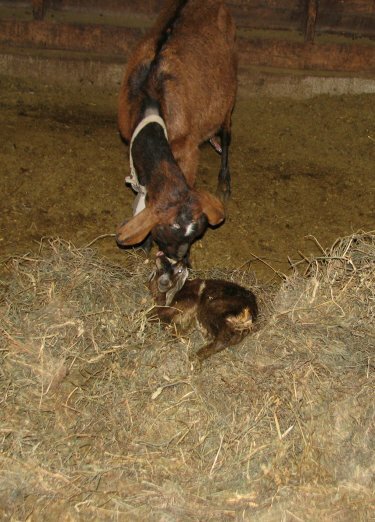 What a feeling it must have been for the girls, to be up so late, walking out to the barn alone at night in the dark, wondering if when they opened the barn door, they would be the first to see the new baby goats and run back to the house to report the news to the family. The first flowering shrub broke open today – the viburnums on the south side of the garden. Paullina joined high hopes today. She is due to give birth April 5. Last year she had 3 female kids! She is 4 years old and we will post Paulinna’s photo on the web site soon so you can all meet her. 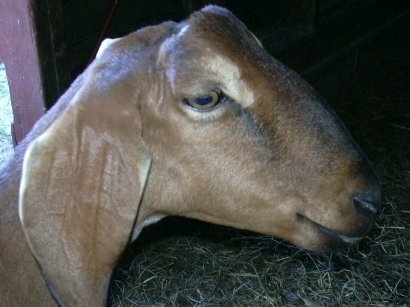 Pauline is less than the perfect Nubian dairy goat as she evidently had her ears frozen at birth, and lacks the classic long ears of her kind. Today Martin described himself as “Mr Cranky Pants” and no one argued with him. This accurate self-assessment will no doubt serve him well in the future. Besides class all morning and fetching goat, that is about the day. 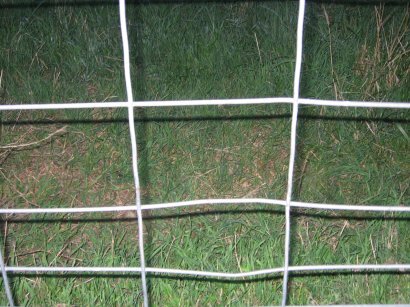 Tomorrow we can try to look at our outside fences and see (it won’t take long for the goat to show us) where they need a little help. Finally got the website update/redesign finished today. Still have lots to add, but for now, it is at least a bare bones presence. Was able to get outside some with Martin. We hauled and stacked Wednesday’s woodcutting. 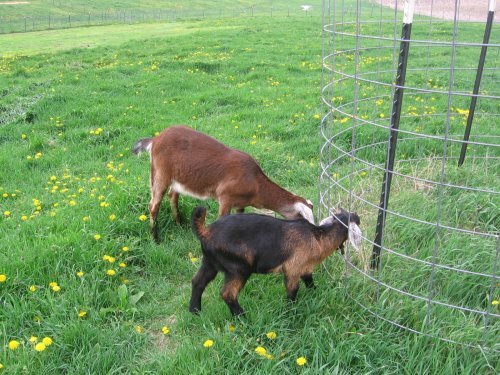 Martin is excited to become a “goatkeeper.” Tomorrow goat arrives. We made the mistake of reading the goat book, especially the what can go wrong in labor section. It’s a good thing I read the James Herriot books long ago, so I will be prepared for any eventuality. 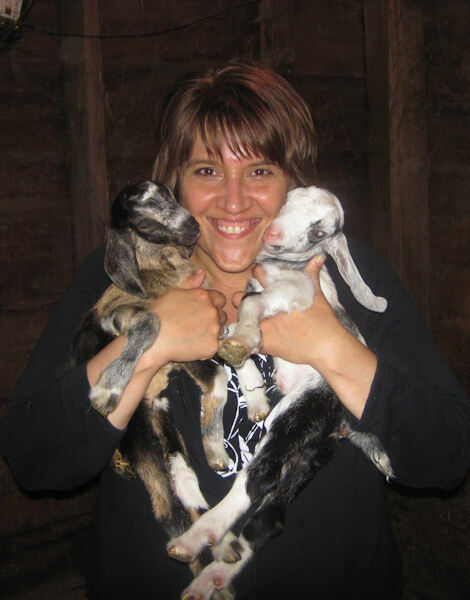 February 24, 2005 – Got your Goat? It’s all but official now. Permanent goat will be coming to high hopes. 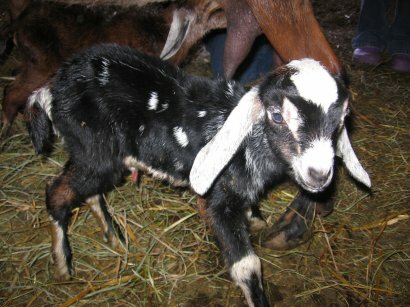 We have in the past performed goat-sitting, but we have just committed to buying a bred nanny. Our motivation is simple – we may nevermore run out of milk. The doe is set up to come in two days and should give birth within a month. At that time, the milking will commence. 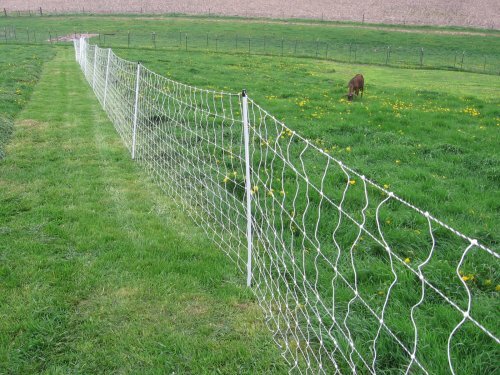 Of course, there are the minor details like building a milking stanchion and making sure the fences where goat will trod are goatproof. 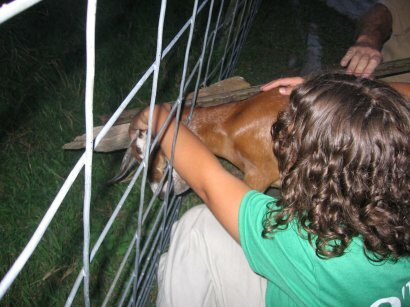 Daughters have promised to care for goat to best of their abilities. I’m sure this is just the first chapter of many revolving around goat.